What to expect at an OBGYN visit. I’ve been reading A LOT of late about obgyns, exams, what to expect. Being an obgyn and all, I figured I’d weigh in. When you have a certain dynamic with patients it’s hard to imagine that not all visits go the way one might expect. I had a patient, just today in fact, tell me I was her favorite doctor. NEWSFLASH! When have you EVER heard of an obgyn being ANYONE’s favorite doctor? I rank right up there with the dentist in terms of who women prefer NOT to see. With the recent happenings at USC, if you don’t know, you should sign up for my email/blogs as I already talked about it there in the way only I can……Anyway, with the recent happenings at USC(obgyn misconduct), and of course reading everyone else’s “weigh-in” on what these visits should and shouldn’t involve, I thought I’d give you my thoughts. College should NOT be your first encounter with an obgyn. I know. In the real world, it oft times is. I typically recommend a meet and great between the ages of 13 and 15 JUST to touch base, say “hi!”, review what an obgyn does, and lay the ground rules for how these visits typically go down. Be comfortable with your obgyn. If you don’t feel as if you can be fully disclosing, or if you don’t feel as if you have a “connection” with your gyn, choose another provider. Remember, you do have a choice. It’s YOUR care. Be proactive. Be clear about the purpose of the visit. Not all visits require an exam. Let me repeat that. NOT ALL VISITS REQUIRE AN EXAM. There are numerous instances that come to mind where an exam is not necessary. Hmmmm, how about the initial meet and greets where we just talk about the role of an obgyn in your life, or if we’re talking about contraceptive options, family planning, discussions about periods, etc., etc., etc. I LOVE girl talk! Trust, for those that see me, we have plenty of it. Make sure everyone is on the same page. Have your gyn go over how the exam will “play out.” For me, if it happens to be my first time meeting you, initially, I prefer to meet you fully clothed. I mean, who wants to meet someone for the first time in a thin robe with the front open?!?!? “Not I said the fly.”(I crack me up!) If an exam is to be done, I go over all the specifics; i.e., state if there will be a breast exam, pelvic exam, and how these things work. If you don’t want an exam, you certainly can make your wishes known. If you feel as if you want a chaperone in the room, know this is ALWAYS an option for you. The key here is that NOTHING should be happening to you without your consent or without you feeling “comfortable” with it. Keep in mind, a visit to the gyn IS a medical visit. Medical history taking will and should be thorough. This will include things such as reviewing medical problems, surgical history, current medications, family history, inquiries as to whether you smoke, drink, do drugs, etc. As an obgyn, our history taking also includes a sexual history. NOOOOO, we’re not trying to be in your “personal affairs,” but it helps us establish which screening guidelines are appropriate as ACOG(the American College of Obstetrics and Gynecology)does recommend annual screening for gonnorhea and chlamydia in those persons under 21(if you’re sexually active) and through the age of 25. Screening for cervical cancer with pap smears doesn’t begin until the age of 21. If any of this makes you uncomfortable, or you just aren’t “feelin’ it,” either ask for a chaperone or see another obgyn. Trust your gut. Always listen to that voice on the inside. It rarely, if ever, steers you wrong. In case the obgyn you initially see isn’t “the one” for you, not to fear, there are A LOT of us to choose from. You will find the right fit. Hoping this blog post has both entertained and informed. 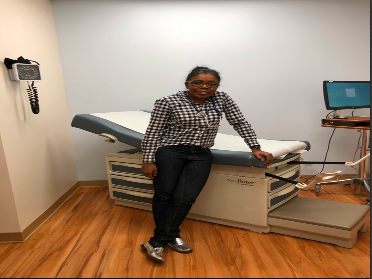 Next Next post:273 – Ask Dr. Angela – What A “Normal” OBGYN Visit Looks Like.